An economical unique broad spectrum cleaner that lifts and emulsifies oils and greases. It disperses and holds small particles in suspension. Strongly concentrated: a 2% solution is recommended for most cleaning applications. Recommended for the dairy and food laboratory! Some culture media get baked on flasks in the incubation process... MICRO-90 soaks them clean. 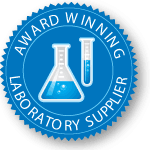 Soak lab glassware with a 2% solution when soiled. Greases and food residues come off the next morning when glassware is rinsed. 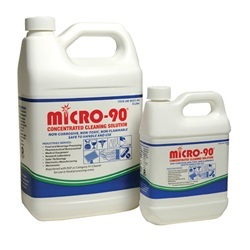 Use MICRO-90 for pipet washing. Pipets go into a 2% solution immediately after use, then are rinsed in a siphon rinser. All fats and proteinaceous materials are removed. 100% clean. A chemical analysis for residues of MICRO-90, with a limit of detection of 10 ppm, detected no MICRO-90 residues. Also, X-ray activation analysis of surfaces cleaned with MICRO-90 indicate that less than one third of a mono-layer of MICRO-90 is left on Pyrex® glass after 4 rinses. No toxicity or inhibitory characteristics. As tested in accordance with the Inhibitory Residue Test, Standard Methods for the Examination of Water and Wastewater. Cleans safely. Very low toxicity, skin irritation and eye irritation. Rated non-hazardous. Non-polluting.